Soft skills are those personable skills that help us to get along with other people and help us to be successful in our personal and professional lives. The soft skills include “people skills” but are not limited to only the people skills. If a person is devoid of any soft skills, they are not likely to have any successful relationships in their life, be it personal or business. For the most part, unless someone is really a reprobate, it is a matter of what soft skills we possess and to what level of maturity we have for those soft skills. Soft skills are very important in any context. Or, at least, important if you want to be successful in life and business. They are an important part of the equation. But, the question is, which soft skills are the MOST important and why? 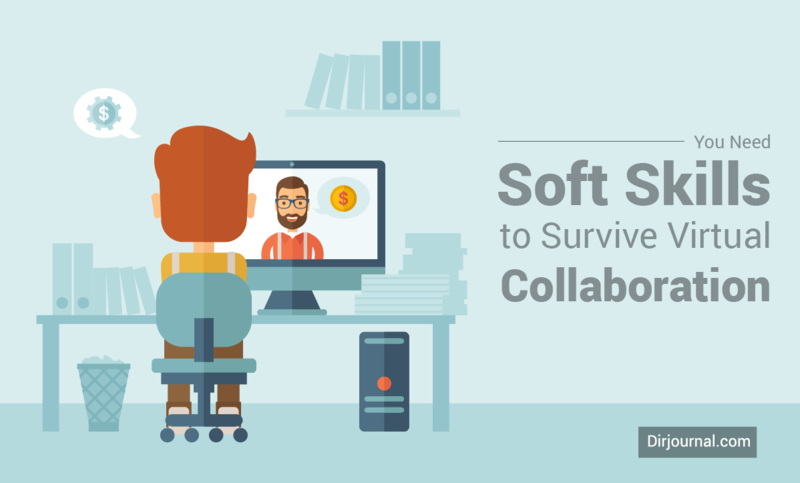 What is the Most Important Soft Skill for Virtual Collaboration? We asked three people to give us an idea of what they think is important, as far as soft skills and share a bit of their insights with us. There have been interesting, and consistent, responses. Their feedback is provided, below. “Most of my communications are via email and instant messaging [private message]. Humour doesn’t work. Sarcasm doesn’t work. Complex sentences with conditional clauses do not work. In addition, there are the language barriers (even UK/US), and culture barriers. I work a lot with [people to whom English is not their first language]. I find the language and culture barriers to be major obstacle to a smooth conversation. I apply what I have learned talking with [these associates] in all my online conversations. I avoid political references that might not be understood, avoid English “understatement” and any references to places. “Too often I see people get all upset with each other over perceived slights on FaceBook, Skype, Google Plus, etc. People make assumptions about what the other person means, assumptions that might not always be correct. That comes, I believe, both because we are conversing within a wider conversational context (Planet Earth), as well from the lack of visual and tonal cues when people “speak” online. People bring more bias into their interpretations of what other people say. All three of our panelists agree that communication is key. This is also an area where all three agreed that the breakdown can happen. Whether it is because of language/cultural differences, lack of body language (lack of visual), or simple misunderstandings, the results of a communication error can cause larger problems than the original misunderstanding. One of the things that I have observed, in group settings, is that many times it is not realized that there is a communication mishap. As David Leonhardt points out, sometimes we get so person-centric on our own views and interpretations that we may not even realize that there could be another interpretation. This is not a case of who is right and who is wrong, but listening and attempting to understand each other. As Phil Turner points out, having associates who speak other languages as their first language and have a different cultural background helps him to have perspective on all online communication opportunities. Trust is another area that is important. Anand Karasi mentioned the importance of that trust in his reference to “always selling.” For some of us, the term “selling” is not the first term that comes to mind in the context of soft skills, but it makes sense. This is not selling in the sense of giving away our rights and offering them to another, but instead, selling in terms of convincing others that we have something valuable to offer to the personal or business relationship. One would hope that that selling is an honest representation of who we are. That is also the basis for building trust (honest representation). Without attempting to honestly represent ourselves, the “trust” aspect will not be built. The opposite of building trust is selling a scam. It is true that soft skills are important in selling the scam, as well. The question is, what are we trying to represent when building trust? It is also helpful for us to identify the importance of trust and whether that is something that we want to include in the building of relationships. This one is an area where what could have been a small issue (misunderstanding) turns into a larger (sometimes irreparable) situation. Also, there are many times when group participants truly believe that they are cooperating and that they are willing to resolve issues, when, in reality, they are adamant about being right, rather than finding an amicable solution. This person-centric view is often the cause of bigger issues, whereas a group-centric view would be more healthy and help to avoid some of the conflict that erupts. I witnessed a recent misunderstanding in a group environment which really came down to a regional colloquialism colliding with a literal interpretation. A colloquialism is something that is somewhat like a cultural response in a particular region (or cultural background) that is not necessarily common to all cultures. This is something that Phil Turner reference, above. It goes beyond language and it is something we have to watch, even for ourselves, as we are communicating with other people who are not from the same region or culture. Listen to others – rather than breaking down someone’s sentence into a literal translation of each word, listen within context. Try to understand what they are communicating. If you do not understand, ask questions. Remember, too, that not all people are good communicators. Add to that the process of writing and there can be many things that people simply are not able to articulate in a way that others will understand. Cut them some slack. Set aside the offensive – realize your “tone,” even in writing. If you are not sure, ask a close friend if you are coming across as a “know-it-all,” or a bully, or the appearance that you feel you are always right. You may indeed always be right, but sometimes the best answer is to keep that to yourself. Set aside the defensive – now that you have set aside the offensive “bully” attitude and presentation, set aside the defensive, as well. Not everyone in the world has to see you the way you see you. They are not going to anyway, so there is no need to be so defensive that you turn people away from you. Instead, walk away peacefully. Approach each situation with perspective – Similar to what Phil Turner described, understand that everyone has a different perspective. Listen within that context. Do not jump to conclusions that what someone is saying is opposed to what you are saying. And, even if it is, that is ok. We are entitled to our views. Don’t sweat the small stuff – In the example I gave above, it came down to two words. Is it really worth losing a friendship or having a blow-up over two words? Pick your battles and let the small stuff go. Decide, for yourself, at what point a topic hits a “non-negotiable” point where you have to fight to be heard. Personally, I would opt not to get to that point at all, but at the least, don’t run to cut people’s heads off on every topic that presents itself. Know when to take the conversation elsewhere – If you are really in conflict with someone, and you are in a group, decide to call a truce, even if it is a temporary one. What that means is either take the misunderstanding into a private chat, a private audio call, or decide to resolve it later. You can also agree to disagree and decide that the issue is resolved because it simply isn’t worth the fight. Remember that you do not need to be right all the time – we stated this one already, but it is worth noting again. This world is full of many, many, many people. The people of this earth are going to have different perspectives. Do not sink to the level of thinking it is all about you and that the only opinion that matters is your own. It is ok to let someone else share their perspective. Do not impose your perspective (force) on another – If you feel you are wronged, you can gently say that you feel you have been wronged, but don’t hunt people down to insist that they need to apologize or bow down to your opinion. Mention, kindly, that your feelings are hurt, but only do it once. If you scream it at the top of your lungs (virtually speaking), insisting that you get attention, you will be hurting others with your behavior. That insistence comes off as bully behavior. Instead, consider being the nice person who actually extends kindness instead of bullying. Even I know that I am not always right and that these tips are only suggestions based on my own experience and my doctoral studies in organizational psychology. All this shared, feel free to keep (or throw away) any tips that you like (or don’t like).